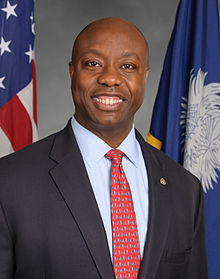 Timothy Eugene Scott (born September 19, 1965) is an American politician and businessman serving as the junior United States Senator from South Carolina since 2013. Appointed by Governor Nikki Haley to replace the retiring Jim DeMint, he later won a special election in 2014 and was elected to a full term in 2016. A member of the Republican Party, Scott was endorsed for the Senate by Tea Party groups. In November 2018, Scott bucked his party in opposing Trump's nomination of Thomas A. Farr for a federal judgeship. Farr had been accused of voter suppression toward African-American voters. Scott cited Farr's involvement in the 1984 and 1990 Senate campaigns of Jesse Helms, which sought to suppress black voters, and a 1991 memo from the Department of Justice under the George H. W. Bush administration that stated that "Farr was the primary coordinator of the 1984 ‘ballot security’ program conducted by the NCGOP and 1984 Helms for Senate Committee. He coordinated several ‘ballot security’ activities in 1984, including a postcard mailing to voters in predominantly black precincts which was designed to serve as a basis to challenge voters on election day." Further explaining his vote, Scott said the Republican Party was "not doing a very good job of avoiding the obvious potholes on race in America." In an editorial, the Wall Street Journal criticized Scott, arguing that Democrats would see Farr's defeat as a "vindication of their most underhanded and inflammatory racial tactics." In a letter to the Wall Street Journal Scott said the publication was trying to “deflect concerns” about Farr’s nomination. ^ a b c d e f g h i "Guide to the New Congress" (PDF). CQ Roll Call. November 4, 2010. p. 59. Archived from the original (PDF) on July 8, 2011. Retrieved July 31, 2011. ^ a b c d e f "SC elects black GOP congressman; 1st since 2003". The Washington Post. The Associated Press. November 2, 2010. Retrieved July 29, 2011. ^ "Political firsts: How history was made this midterm election". Usatoday.com. 2014-11-05. Retrieved 2015-06-12. ^ Reed, Adolph (2012-12-18). "The Puzzle of Black Republicans". New York Times. Retrieved 2018-07-09. ^ a b c d DAVID FIRESTONE (19 January 2001). "U.S. Sues Charleston County, S.C., Alleging Violation of Black Voting Rights". New York Times. Retrieved December 23, 2012. ^ "The Club for Growth – South Carolina, 2009–2010 House Scorecard" (PDF). Scclubforgrowth.org. Retrieved 2015-06-12. ^ O'Keefe, Ed (2014-04-22). "38 GOP lawmakers join Ron Johnson's Obamacare lawsuit". Washingtonpost.com. Retrieved 2015-06-12. ^ "38 GOP lawmakers join lawsuit against ObamaCare subsidies". Foxnews.com. 2014-04-23. Retrieved 2015-06-12. ^ "Tim Scott on Civil Rights". Ontheissues.org. Retrieved 2015-06-12. ^ "Tim Scott on Immigration". www.ontheissues.org. Retrieved 2019-01-30. ^ Dennis Lynch. "Police Body Cameras: Sen. Tim Scott Urges Senate To Discuss Technology In Wake Of Walter Scott Shooting". Ibtimes.com. Retrieved 2015-06-12. ^ Collins, Jeffrey (November 4, 2014). "Tim Scott wins election for US Senate in SC". Washington Times. Retrieved 3 September 2015. ^ "3 Black U.S. Senators Introduce Bill to Make Lynching a Federal Hate Crime". Retrieved 2018-07-04. ^ Stern, Mark Joseph. "GOP Senator Defects, Sinks Trump Judicial Nominee With History of Racist Writing". Slate. Retrieved 19 July 2018. ^ a b c "Scott to oppose Farr nomination to federal bench in NC, ending chances of confirmation". thestate. Retrieved 2018-11-29. ^ Curtis, Mary (18 December 2012). 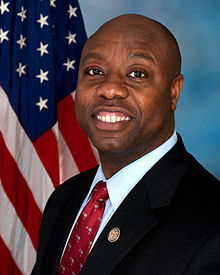 "Tim Scott's importance as GOP senator and symbol". Washington Post. Retrieved 13 August 2014. ^ "Statewide Results : 2008 General Election". Enr-scvotes.org. Retrieved 2015-06-12. ^ "Statewide Results : 2010 Republican and Democratic Primary". Enr-scvotes.org. Retrieved 2015-06-12.